Pelotons are essential in a bicycle race. Riders in a cohesive group save energy by riding close, reducing drag, and improving performance. Even during the most grueling legs of a long and arduous road race like the Tour de France, there’s a profound sense of camaraderie and unwavering mutual respect among riders in the peloton. At Farber, the same is true. We’re committed to teamwork, with professionals from our 10 practices working collaboratively together every day to maximize efficiency and effectiveness, focused squarely on delivering results for clients. 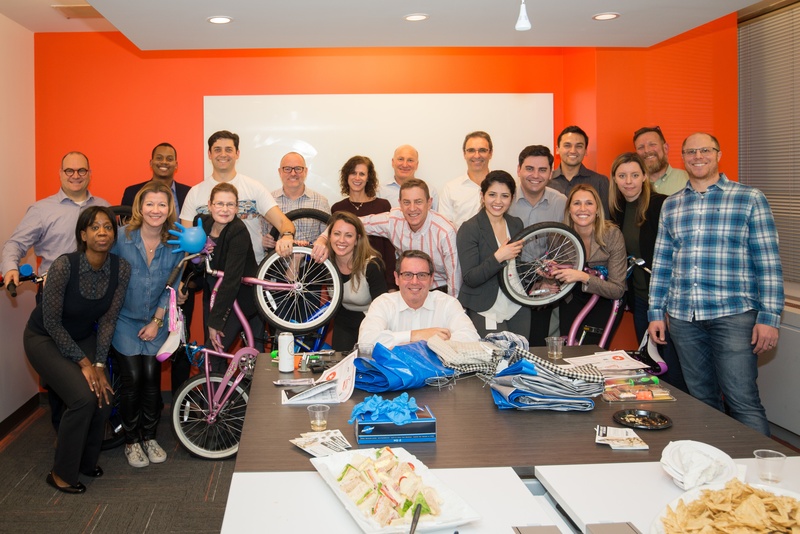 To celebrate this spirit of collaboration and give back to our community, the Farber team recently participated in a unique bicycle-themed team building exercise in support of our annual Drive to Thrive Campaign for Kids Help Phone, Canada’s only 24/7 counselling and information service for young people. It’s a cause that our company has supported for many years because of the critical role it plays for our youth. During the exercise, Farber staff were divided into groups. Each group was tasked with assembling a children’s bike, under the watchful eyes of our volunteer judges Sharon Wood, CEO of Kids Help Phone, and Gavin Brauer, co-founder of KindHuman Bicycles, a performance bicycle company which is committed to making cycling more accessible and growing the sport from the ground up. Gavin, who acted as resident bike-build and safety check expert, was also kind enough to facilitate the team building session. To make the exercise even more challenging, team members who were assembling the bikes had to perform the task blindfolded, relying on the guidance and instruction of their colleagues. As the build progressed, teams faced numerous challenges. At one point, during a crucial stage of the bike assembly, judges shuffled and traded team members to other groups. Groups that had been making strong progress suddenly found themselves needing to adapt quickly to new team members and work styles. Despite the challenges, the Farber team thrived and eventually all the bikes were completed. In total, the Farber team has raised more than $15,000 in support of Kids Help Phone. The bikes that were built, along with $15,000 worth of toys, were delivered to five Ontario charities across the GTA as well as Niagara, Durham, London, and Barrie. Mattel Canada is a major sponsor and supporter of Kids Help Phone and has generously matched Farber’s fundraising with toys for the past three years. Although it wasn’t quite the Tour de France, seeing our team come together as a peloton to work together effectively and support one another while contributing to our common goals for the workplace and the community was still an incredible experience.